Botox treatment is a revolutionary approach to reversing the affects facial wrinkles. Crow’s feet, worry lines and laugh lines can all be a thing of the past. These are referred to as dynamic wrinkle lines and all are treatable with this procedure. Cosmetic denervation is the process of injecting botox into the tiny facial muscles that create the wrinkles. Call us at Archstone Oral and Facial Surgery Phone Number (415) 963-4121 for more information about Botox or to schedule an appointment with Dr. Dela Rosa in Daly City. 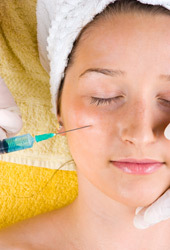 Botox injections are performed without anesthesia because it is virtually painless. Only a very small sting is felt when the injections are made. The effects are not permanent and may need to be repeated two to three times per year to retain the effects. Research has suggested, however, that long term use of the injections leads to a longer duration of each treatment’s effect. Patients over the age of 65 may not experience as dramatic of results. Botox is only useful in treating expression lines and cannot be used to repair sagging skin caused by aging. After the operation patients may experience slight bruising around the area that quickly fades. Normal activities can be performed immediately. Possible side effects are temporary weakness of nearby muscles or in rare cases an eyelid may droop. Botox is completely reversible so any side effect is only a temporary condition. The doctor will explain all risks associated at the time of your consultation.